Doris Godfrey sits with her Locks Of Love donation Tuesday night, surrounded by the Jefferson Terrace Salon & Spa staff. 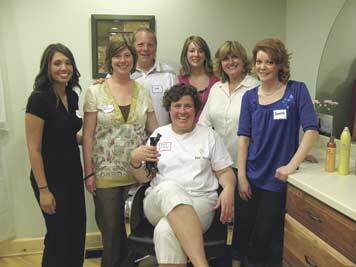 From left, Mary DeMarco, cosmetologist; Cindi Manocchio, cosmetologist; John Helgren, massage therapist; Erica Winterberger, cosmetologist; Amy Hanson, owner and cosmetologist; and Samantha Mighells, cosmetologist. Inspired by Godfrey’s donation, the staff of the Jefferson Terrace Salon & Spa donated their time and services Tuesday, with money raised throughout the evening going to Band of Parents – a non-profit organization comprised of the families of children with neuroblastoma. The group’s mission is to help find new ways of fighting childhood cancer by funding research.